Not long ago I caught the end of a conversation in a grocery store parking lot. In a very animated voice, the woman was saying, “…but you just can’t do that to someone who depends on others to do the right thing by them.” My imagination flew into action as the group—two ladies and two gentlemen—got into a van and drove away. The sign painted on the side door read: HELP For Disabled Children Is Here. I wondered. Do you remember Mother Teresa? She passed from this earth in 1997. However, while on the planet she taught us a lot about LOVE. “I am not sure exactly what heaven will be like,” she is quoted saying, “but I know that when we die and it comes time for God to judge us, He will not ask, ‘How many good things have you done in your life?’ rather He will ask, ‘How much love did you put into what you did?’” How will I answer that question? Will examples of what I’ve written become evidence? 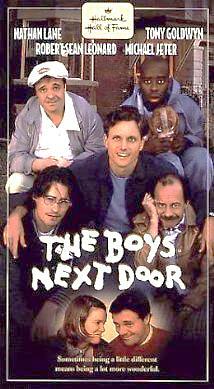 Back in 1996, I watched a TV movie titled: THE BOYS NEXT DOOR. It was adapted for film from a stage play by playwright Tom Griffin. The story centers on a social worker (Jack) who found himself in a “job” that basically made him the “house-father” of four mentally challenged men living “regular” lives (to the best of their abilities) in a neighborhood house. At one point in the story, there is a State Senate hearing that will decide the sustainability of this group home. Jack and one of his charges (Lucien) are seated at the defendants table. In this formal setting, the writer developed a short soliloquy, spoken by Lucien who steps aside from his mental illness for a few brief moments and speaks to the senators as if he were a “normal man.” This superbly written dialogue is forever etched in my memory. I would like to share the whole scene, but with limited space I will offer one quote. Do you have such thoughts—such words—in your collection of BOOK ideas? Are those concepts tossed about on scraps of paper or organized neatly in files? PLEASE! Don’t waste another minute! Get your stories written! The human condition of our world NEEDS to be encouraged! There are too many lights hidden away under self-doubt and the fear-of-success. You’ve been given the GIFT of writing—the skills and inspiration—to make a difference. GET TO IT!